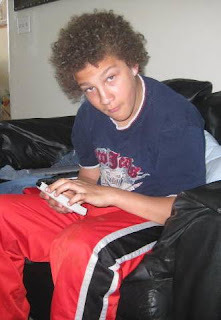 Remember when you were growing up? No speaking at the dinner table unless you were being spoken to? I remember those days very much! Those days are no more! We want to be involved in our children's lives, especially since it seems like everyone is moving in 20 different directions! Enter Dinner Games by Families with Purpose! What Makes these Dinner Games So Great? 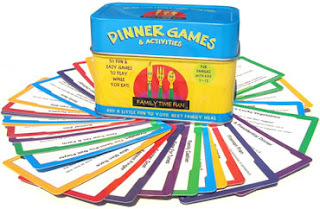 Appeals to a Variety of Ages - Dinner Games are available in two styles; The Original Family Dinner Games are designed for kids ages 5 - 12 and the Beginner Family Dinner Games are best for kids ages 3 - 6. No Hassle - The dinner games are designed to be played at the dinner table while the family eats their meal. They require no advance preparation and most only require the use of supplies found on the dinner table. 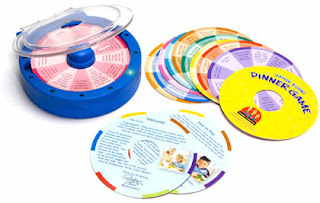 Educational - The dinner games are designed to sharpen the family's critical thinking, social, math, memory and language skills all in a fun way. Open up Conversation - Some of the dinner games use the family dinner to open up family conversation using thought provoking conversation starters. Encourage Good Eating Habits - Many of the dinner games involve food and encourage the family to eat their vegetables and drink their milk. Enhance Closeness - The games make the family laugh and encourage conversation both of which enhance a family's closeness. Mess Free - All of the dinner games are laminated making spills easy to wipe off and clean. Even though he doesn't look thrilled there, he loved the game too! We all played these the first time on Easter Sunday and we have played at least once a week since! There are so many different cards and topics in these games, you could play for hours! Here is a sample of 12 of the 132 dinner game activities. Pickup something and have everyone name a word that rhymes with it. What's the funniest thing you saw this week? Sounds like fun huh? Do you want to win one?! Then tell me in your comment which game you would choose out of the Beginner, Original, or Gather Round style. *Remember, if this main rule is not followed, no entries will count. This giveaway will end at Midnight EST on 5/30/09. I will email the winner as well as post the winner's name and winning comment here. The winner will then have 48 hours to get back to me or I will have to choose another winner. This giveaway is open to residents of the US and Canada. Thank you to Families with Purpose for this opportunity! While you're at it, go check out their blog for tons of tips and knowledge! Head back over to the Give it Away Now! Blog Giveaway Carnival at Mom Most Traveled for more great giveaways! I like the gather round dinner games! I like the original dinner games. I think we would like the Original style game. What a great idea! I think my daughter would like the gather round with button and lights! i follow you on twitter and saw you on the fitfam party tonight! I'd choose the beginner game for ages 3-6. Sounds like great dinner-time fun! I would choose the original, my kids are 10 and 12. I would choose the Original game. Thanks. The Gather Round game looks like fun! we would love the beginner game. The Gather round style. Family dinner is so important! I would choose the Beginner for our family. Thanks! We'd like the Beginner. Those games sound really fun! My 3yo daughter struggles to learn so the beginner game would be perfect for us. Rainbow Dinner is right up our street! My kids are 3 and 6, so it's nice to find something they can both play. I'd love to win the beginner game. Thanks so much for the chance! I would like the Gather Around game. We would choose the Beginner game. I would choose the Beginner game, as my children are both younger! I am following your blog, both on blogspot and on google reader. I am subscribed to your blog via email. Would love to win the Original Family Dinner Games. I would choose the Classic! I think I'd choose the classic version. Since my kids are little we would like the beginner game! We would like the original version! I would like the Beginner game for my little guy. We would love the Beginner game. My son would love this.